Some of the greatest tests we're up against are the ones that we can't prepare for, that we don't see coming, and that make us confront our own worst fears. Dave's girlfriend Wendy called me on Saturday night. She was crying, and with the kind of news that knocks both the wind and sense out of you, she told me that one of my best friends, Dave, had passed away suddenly that afternoon from health related complications. He was a friend that I had grown up with through film school, who I had worked on numerous film projects with, who I drove cross country to California with twice, and who I considered one of my closest allies. He was many things to me and those who knew him, but in an instant it felt like they all disappeared under the weight of that call. 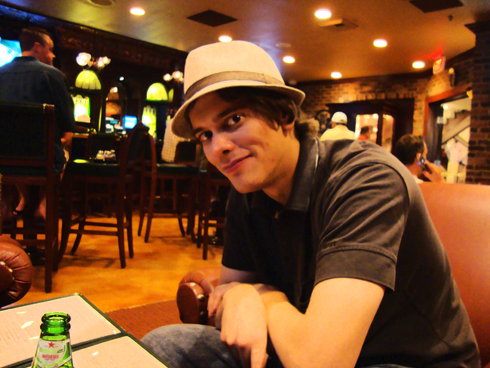 Going for a drink with Dave in Las Vegas in 2010. There's never the right words for situations like these, not that I've ever been through anything like this before. Between my own numbness and shock, I'm only further saddened by the cruel and poetic twist that over the last year Dave had found the love of his life in Wendy, and just weeks ago welcomed a new baby boy, Darwin, into their lives. He had never been happier. It seemed that after 27 years of striving for this very life, he finally got it, and then left us before he even got a chance to settle in. Dave, Wendy, and their new born son, Darwin. I met Dave on my very first day of film school in 2002 at orientation. He was a character to say the least. Awkward and a bit clumsy, he had a passive aggressive temperament that always made being around him hilarious and eventful. He was witty and smart. In those early years what he occasionally lacked in self assurance he made up for with biting criticisms and commentary about how he felt the deck was always stacked against him. As we grew older, it was this very thing that made him so unique and interesting and helped him find his own voice and style. There was no one quite like Dave. 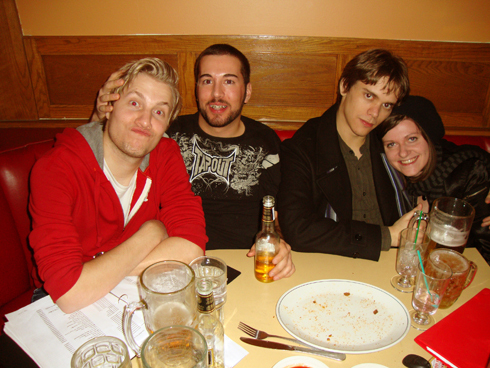 One of the old hangouts at Sparky's in Regina, SK in 2009. 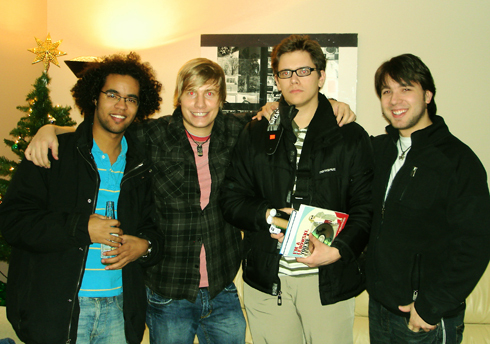 A reunion of the first year film crew in 2009. 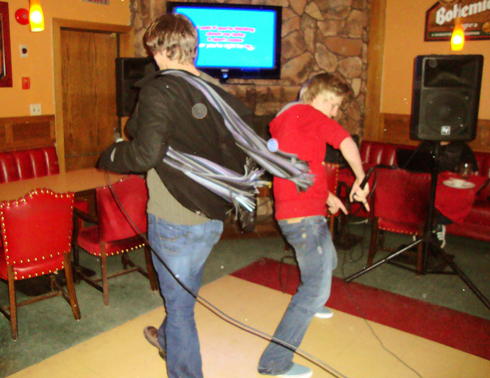 Dave and I rocking some Michael Jackson during karaoke at Sparky's. It was towards the end of my film school career in 2007 and 2008 that I feel like our friendship became more meaningful and deeply ingrained. Tyler, Rowan, Dave, and I became a more tight knit group. We would hang out and discuss film ideas, aspirations, relationships, and where we were going. These conversations would inevitably become philosophical, often motivated by Dave's curiosity about something going on in his own life. He was always an open book, and for better or worse he wanted people to know how he really felt. He admired honesty as much as he gave it. He was always one of my favorite people to talk to simply because he had an opinion on everything. He always seemed fascinated by how someone else did something compared to how he would have done it. In the context of film production, this provided countless hours of creative brainstorming and constructive conflict. His scripts, blogs, lengthy emails, and songs were the proof that this formula inspired results. High fives after Dave got his new condo. 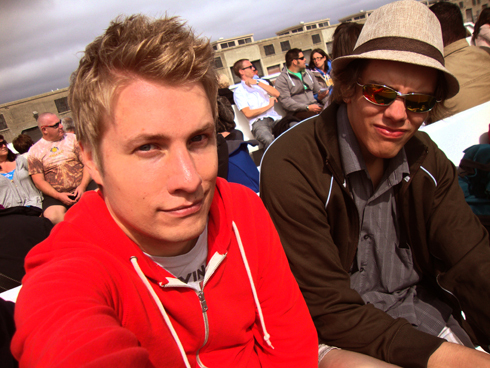 On the ferry to Alcatraz Island in 2010. 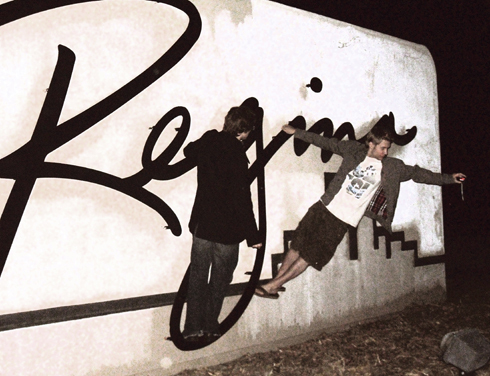 On a return visit we went out to the Regina city sign to recreate a moment we all shared a few days before I moved away from the city. 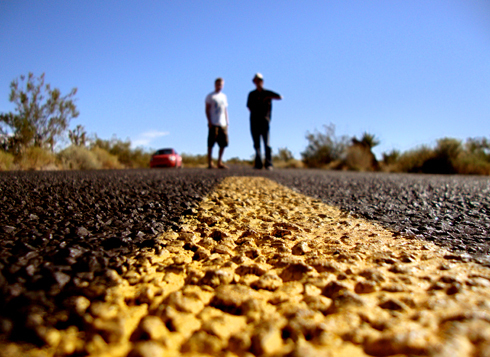 By 2009, with university behind us and our new struggles with adulthood more apparent than ever, Dave and I discussed the idea of a road trip to Indio, California where his parents had just bought a vacation home. We didn't know it at the time, but the trip would end up providing some of the most genuine and thought provoking moments of our entire friendship. From mountains to deserts, the discussions we had were as varied as the scenes that complimented them. Driving through Joshua Tree in California. 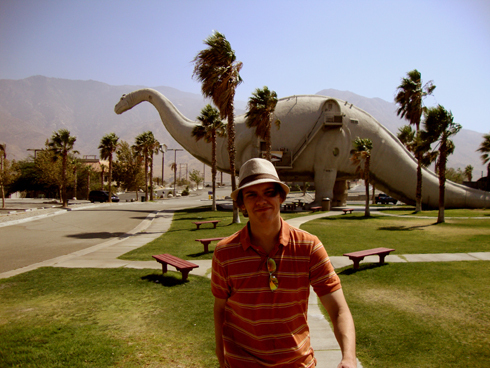 At the Cabazon dinosaurs, a site we admired because of its relation to The Wizard starring Fred Savage. Need I say more? We had never spent so much time one on one together before then, but what came out of that experience was a greater appreciation and understanding of who we both were. Indio may have been the destination, but it was the feeling that we were both setting out to create and find experiences along the way that made it seem so defining. We always jokingly referred to the trip as our Sideways. Our friendship had never been stronger. So much so, that in 2010 neither of us hesitated when we casually proposed the idea of taking even more time to do the same road trip again, this time driving home up the coast. Those moments are not only some of the most memorable that I ever had with Dave, but are actually some of the most memorable experiences that I've ever had. Period. I can't believe your gone Dave, but I need you to know what a huge part of my life you were. You brought out the best in me, you encouraged me with your honesty, you made me laugh without trying, and you shared in some of the most defining moments of my twenties. I'm never going to know another person quite like you, and I can't begin to express how much that hurts after all we've been through. 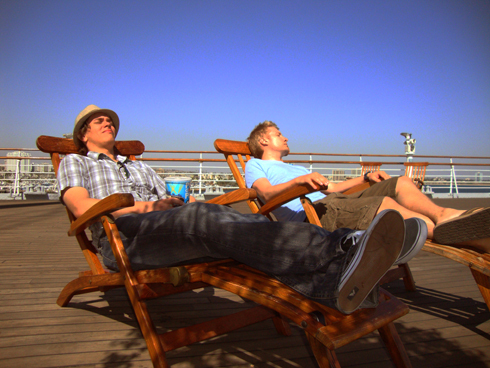 Chillin' on the deck of the Queen Mary in Long Beach. 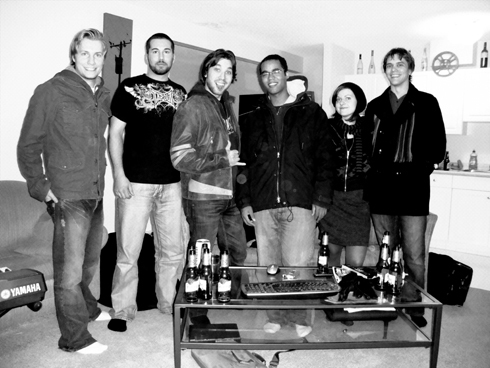 Our Christmas gift exchange in 2007. 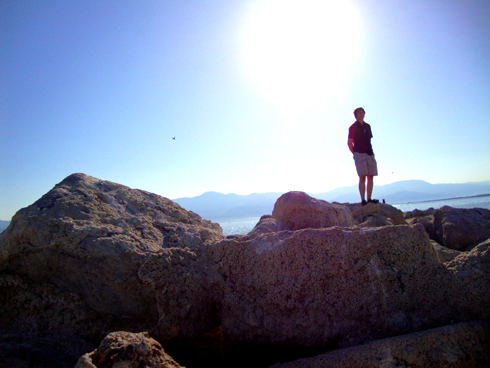 Dave taking some time to daydream as we explored the Salton Sea. When I saw you for what would be the last time in August, just days before Darwin was born, the last thing you said to me was how excited you were for all of us to get to be a part of his life. It seems that statement means more now than you could have imagined. I'll do my part to tell Darwin all about you and let him know how great his Dad really was. We all will. I miss you, man. I'll never forget you. Here's one of the videos I made after we got back from our 2009 road trip. The tone seems even more appropriate now. Luke, this is the most beautiful post I have ever read on your blog, and it has me in tears. Your relationship with Dave was special and I think you both knew that. He admired you and you admired him. You were a good match for each other. Everything you have wrote here is definitely, "Dave". There isn't a single bad thing you can say about him or that anybody can say about him. He was one of the few people I had ever met who was truly special without having to fake it. The world just seems dimmer now. I am happy for the time I had with Dave and he changed my world forever. He left a piece of himself behind and as painful as it is right now to admit that he is gone, he will live on in every single person he crossed paths with. They say that every end is the start of a new beginning and that is what Dave has left behind. He left a world of opportunity to a son and to the chosen he blessed with his presence; he left hope, that his end is your new beginning, giving you the privilege to continue learning from him. We struggle for answers but sometimes the struggle is the answer. Frederick Douglass said “There is no progress, if there is no struggle”, so through this struggle good will prevail. I only knew who Dave was but I do know that he was loved and will be missed by many, my condolences to all. Luke, I'm so sorry to hear that you have lost such a dear friend. 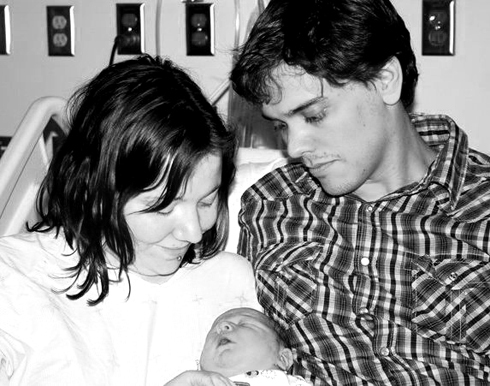 I just read Wendy's birth story a few weeks ago and I'm just dumbfounded about what your friend Dave has left behind. You all must be so devastated, especially Wendy. My thoughts and best wishes are with all of you. I hope you find some comfort in each other. All My Best, Leslie. Well said, sir. This is a great summary of not only your relationship with Dave but mine as well (minus the Indio journey). I couldn't have said it better myself, although I'll never stop trying. It's a tough thing for us all right now to go through, but thankfully we're not alone - there's no shortage of people who loved Dave. Therefore, the stories will live on. I'm sorry to hear about the passing of your friend Luke! I can only imagine what it is like for you right now. From the very well written post you have made, he sounds like a great guy. I had always wondered who you went on your road trip with, sounds like you two had a blast. My condolences go to you, Tyler, Wendy, and all that knew him. Thanks for all of your comments everyone. It's always nice to be reminded of the support I have surrounding me.